As students and faculty come and go from events and seminars in the Allan Rosenfield Building they have a new opportunity to learn about the man for whom the building is named. A tribute wall on the eighth floor honors the late Dean, who led the Mailman School from 1986 to 2008. Once it became known that he was diagnosed with Amyotrophic Lateral Sclerosis (ALS), a fatal motor neuron disease, many foundations and individuals who had been inspired by Rosenfield came together to create a fund to name the building after him and honor him while he was still alive. Over the last six years, his wife, Clare Rosenfield, organized the display, which highlights his important accomplishments in global health, particularly in maternal mortality and HIV/AIDS. In a 2008 remembrance of Rosenfield, the New York Times columnist Nicholas Kristof called him, “one of the giants in the world of public health,” with a legacy seen throughout the developing world. “Allan argued passionately that maternal mortality was a human rights issue, and that governments had to be held accountable when they allowed women to die in vast numbers in childbirth, simply because they were poor, rural, and female,” Kristof wrote. Born in Brookline, Massachusetts, Rosenfield received a B.A. in biochemistry from Harvard College and an M.D. from Columbia’s College of Physicians and Surgeons. One year after he finished training as an obstetrician and gynecologist, he and his wife moved to Thailand with the Population Council to develop the country’s first family planning program, which involved expanding access to birth control, made possible by his then revolutionary idea of using trained non-physicians. As a result, Thai women were better able decide on the number of children they wanted, and the country’s population growth slowed. 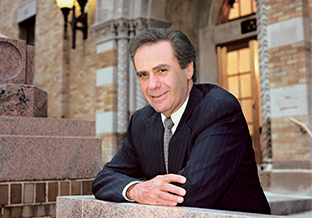 A year after returning from Thailand, Rosenfield joined the faculty at Columbia’s School of Public Health, as it was then known, to create what is today the Heilbrunn Department of Population and Family Health. During his tenure as Dean, the School grew in reputation and size, and in the early 2000s, moved to its current home at 722 West 168th Street. In an influential 1985 article in The Lancet, Rosenfield drew attention to preventable deaths from pregnancy in developing countries. Subsequently he helped create the School’s Averting Maternal Death and Disability (AMDD) program, which continues today, providing training and equipment to prevent complications from childbirth in more than 50 countries. Fifteen years later, at the International AIDS Conference in Durban, South Africa, he spoke on the urgent need to take care of all women living with HIV, both before and after they give birth, rather than solely focusing on preventing HIV transmission from pregnant women to their babies, as was the norm then. The speech gave rise to the groundbreaking MTCT-Plus Initiative that for the first time offered treatment to both mother and child. ICAP, the Mailman-based center whose programs have brought lifesaving treatment to more than a million people with HIV around the world, has its foundations in MTCT-Plus. Known for an indefatigable work ethic, the late Dean traveled around the globe to advocate for public health and worked closely with world leaders like Kofi Annan and Bill Clinton. Long after he was confined to a wheelchair, he continued to work at the Mailman School every day until his last three weeks. Around the School, no one was a stranger, and he would make time after work to visit anyone he knew who was in the hospital. “He made everyone feel like they were part of one human family,” says Clare Rosenfield. Among those who supported the project were Christy Turlington, who dedicated her documentary film on maternal mortality to the late Dean; and Bono and Kenneth Cole, both of whom shared his commitment to fighting HIV. Maternal Mortality: Are We Making Progress?